I was pleased with the rise. I had four small loaf pans and when I divided the dough into four equal parts, they looked puny. I was afraid that they would not rise enough but…they did! I refrigerated them overnight and was surprised to see that even during refrigeration, the dough had risen some more. 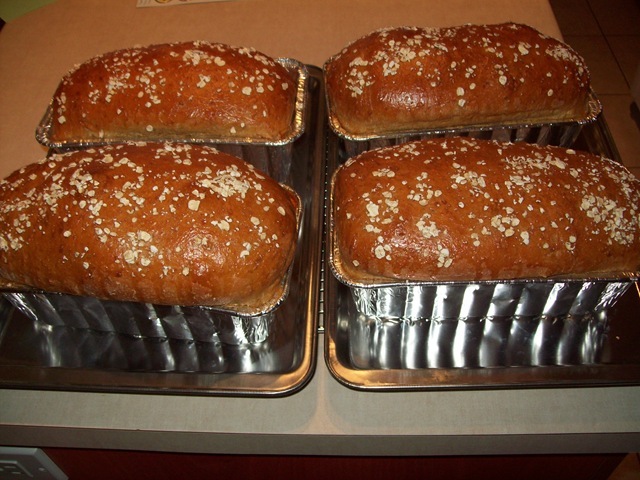 The rich brown color of the loaves was visually appealing. This is a trick I learned from George Greenstein (Secrets of a Jewish Baker). He suggests doing two coats of the egg wash. The first coat must be air-dried, and then a second coat is applied right before the loaves go into the oven. When Father Moon – our parish priest – reminded everyone last Sunday that Saturday’s bazaar can only be successful if everyone pitched in, I realized that I haven’t been as generous with my time as my fellow parishioners. Yes, of course, I’d attend Sunday mass and leave a little something for the collection box, but an inner voice kept nagging that I should play a more active role. Attending church service every Sunday is the easy part; helping the church accomplish its goals is harder. As motivational speakers say, it’s in the harder things that we force ourselves to do that take on more meaning. After the loaves were baked, I wrapped them in transparent paper using the UNICEF stickers that I received a few days ago. 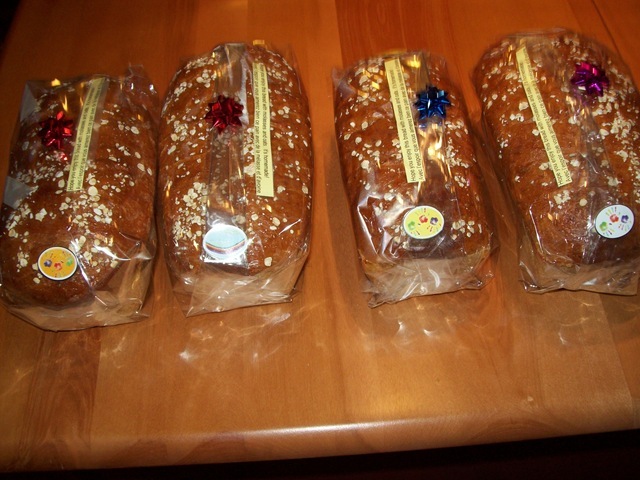 I added tiny ribbons to “perk up” the appearance of the loaves and typed the ingredient list on yellow strips of paper. The recipe is from Canadian Living Magazine and was posted in an earlier blog (https://sotsil.wordpress.com/2009/07/25/holy-molly-molasses/). When I made these loaves the first time, I had used a thick cream wash. I think I prefer the two-coat egg wash of George Greenstein. I hope some parishioners buy them for the sake of the parish’s fund raising campaign (and for the sake of my ego). My dream? That someone will take all four loaves and send them off to a shelter for homeless kids. I know I can make that dream come true myself. I should select a Montreal shelter next year and commit to provide bread. And…from now on, Father Moon and our parish can rely on me! This oats and molasses bread recipe is a keeper and I thank Canadian Living Magazine! Believe it or not, I have never bought molasses before, but I saw this recipe for oat and molasses bread on the Canadian Living web site and…I just had to try it. 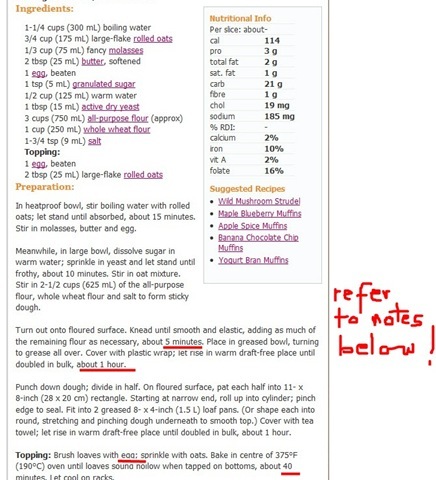 Here is the recipe (taken from http://www.canadianliving.com/food/oats_and_molasses_bread.php. I have added my comments for the redlined sections. Two things worth mentioning: the recipe called for an egg wash. I ran out of eggs so just used 35% cream. You can see this on the slide. I recall having read online that cream or whole milk would make a good alternative if you didn’t want to use eggs or butter. The cream or milk gives off a golden color, the article said. When my loaves came out, I was pleased to see that yes, the golden color was there alright. You can see I had some leftover dough after shaping two loaves so turned it into a sort of challah. The second thing I wanted to mention – the taste was OMG! (forgive the teen talk). I couldn’t get over how tasty this bread was. It was chewy and soft when it was just “hot off the press” but later in the day, when I put a couple of slices into the toaster oven, there was that unmistakable wholesome crackling crunch. Matter-of-fact goodness – that’s how I would describe it. My question: were the oats or the molasses primarily responsible for the great flavor and silky feel of this bread? If not, I’d like to think it was my ever religious kneading! Seriously though, so many principles and theories about bread abound, it’s impossible to keep track of them. When I learned bread-baking early this year, I wasn’t at all tempted to buy a bread machine or an electric mixer. My gut instincts told me to do it the old-fashioned way. It’s not because I’m a slow adapter (as geeks would call me), but because I find that kneading manually is like a baker’s foray into relaxing yoga. Back to molasses. This bread had only a slight taste of molasses. Molasses (I used the Grandma brand) have a strong, sometimes overwhelming taste. As this was my first time to buy molasses, I wanted to know if it had some special health benefits. I was reading this article by Loraine Degraff (http://www.ehow.com/facts_4809658_health-benefits-molasses.html?optype=text) and she mentioned that molasses are rich in iron, calcium and manganese. It can ease anemia and menopause symptoms. One type of molasses – backstrap molasses – is supposed to contain the highest nutritional value. Notes on recipe: I kneaded for 10 minutes, not five. I extended it to 1-1/2 hours for the first rise. I reduced baking time to 30 minutes, reducing the temperature to 350 degrees after 10 minutes. And of course, I used 35% cream as wash!